Rory has played harmonica, guitar, spoons and trombone(!) with many other well known musicians including, from the USA Ani Di Franco and Michelle Shocked, Towns Van Zandt, from West Africa Ali Farke Toure, from San Antonio Flaco Jiminez, from Morroco Hassan Erraji, from Madagascar Tarika, Paul Rodden- virtuoso of the Irish 5-string banjo and from Northumbria Kathryn Tickell to name but a few! 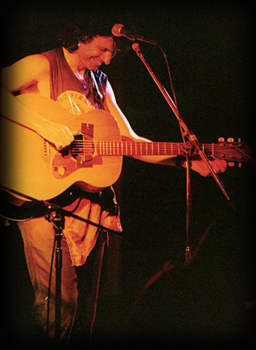 He has toured and played with Australian Aboriginal songwriter Kev Carmody, with Texan songwriters Butch Hancock and Jimmy Dale Gilmour and Donegal’s Pyrotechnicos. Rory worked as a circus clown and fire eater with ‘Circo Ideal’ a small Azteca family- Mexican circus, touring campesinos, pueblitos and tobacco plantations on the pacific coast and in mountain villages.
" I also got shot from a cannon I got paid 3 pesos a mile and travelling expenses!" " I wasn't the lion-tamer,... I only combed the lions hair and cleaned his teeth!" Rory has written songs and music commissioned by 'SHIFTWORK', a Scottish dance and circus theatre based company devising a psycho-comedy theatre-show based on a traditional puppet play called Punch and Judy. Rory has also written songs and music for a BBC radio documentary - about East London's 400 year old Spitalfields fruit and vegetable market. "I permanently damaged my spine carrying heavy loads, but I found a wonderful doctor, when I couldn't afford the operation, he touched up the X-rays." Also has been commissioned to write music for T.V. animation series Aardmans ‘Creature Comforts’ 2003. Has appeared on Channel 4. arts programme 'After Image' and Welsh TV 'Television Ballads'. Rory was also commissioned to write songs and music for Scottish based, Tabularasa Dance Company, A dance-theatre piece for Children called ‘HUFF PUFF and AWAY’ about Wind and Breath. The songs and music appear with other songs on his CD 'Songs for Big Little People'. In 1996 Rory was the BBC's Pick of The Week for his "Invoking The Spirits", a recording of a personal musical journey through Zimbabwe, searching for the Mbira, (an African thumb Piano), playing and talking with African musicians for the BBC's Radio 4. A benefit for Huntingdons disease and a tribute album to Woody Guthrie. Rory has played with Diego Laverde Rojas -Columbian string harpist and BJ Cole on Pedal steel guitar, whose' distinctive textures and colours have complimented Rory's tap-dancing rhythms and syncopated guitar style. Rory also has performed his songs in concerts with a horn section, doubling up on bass and keyboards with Bob Morgan (clarinet, alto sax, keyboards) and Richard Sadler (baritone sax, soprano sax and bass), with Rory also playing Trombone as part of a 'roaming' horn section at festivals,(The Fire-Walkers) playing Rory's tunes in the middle of fields, outside bars, tents and 'blowing along' as a horn section with whoever would invite them to. TEXAS HARMONICA CHAMPION in 1981. BEST LIVE ACT: BBC RADIO 2 FOLK AWARDS 2002. Rory has made up and illustrated some short stories to read his own children. "Rory Mcleod must be the musical equivalent of a six or seven ball juggler... "